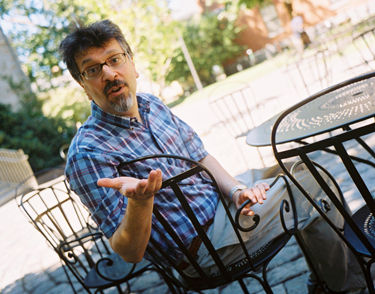 Don Share is Curator of the Poetry Room at Harvard University, where he teaches and is Poetry Editor of Harvard Review; he also teaches in the M.F.A. program in Creative Writing at Lesley University and is Editor of Literary Imagination: the Review of the Association of Literary Scholars and Critics, an Oxford Academic Journal. His new book of poems, Squandermania (Salt Publishing), was finalist for the Dorset Prize in Poetry and his previous book, Union (Zoo Press), was finalist for the PEN-New England Winship Award for outstanding book. His other books are Seneca in English (Penguin Classics); I Have Lots of Heart: Selected Poems of Miguel Hernández (Bloodaxe Books), which received the Times Literary Supplement/Society of Authors Translation Prize; and a critical edition of Basil Bunting's poems, forthcoming from Faber and Faber. He grew up in Memphis. Are you the only writer in your family? I'm the only writer in my family, except for my wife, Jacquelyn Pope, who for me is il miglior fabbro, as Eliot said of Pound. Her book is called Watermark, which was chosen by Marie Ponsot for the Marsh Hawk First Book Award. I really don't write in any particular room or place. I work wherever and whenever I can, quite often on the train: some people read the newspaper or talk on cellphones when they commute, but I carry around books of poems and try to work. I write on scraps of paper, in notebooks that are supposed to be for other things, address books-whatever's at hand. It's old-fashioned, I guess: I don't even own a notebook computer (yet). I've written in every kind of place from the banks of the Mississippi in New Orleans (where the water bobbled up and washed away a week's worth of work) to waiting rooms of doctor's offices after I'd broken an ankle and got stuck with lots of physical therapy. Sooner or later, I piece together what I have on the page and in my head... and then labor for ages over drafts. Your new poetry book, Squandermania, is forthcoming by Salt Publishing. I love the title. Please talk about this book. Squandermania is a word that jumped into my head when I was trying to think about the frenzied energy and unreal depression of living in a world at war not only with terror, but ultimately with itself... about the struggle to do things the right way despite the irresistible tendency to maniacal squandering and destructiveness. It's a real word, by the way: people keep asking me if I made it up. Anyway, I'm a moralist at heart-a relatively timid one, alas, though not sanctimonious, I hope; words have, and ought to have, real meaning, and when we squander our language-along with other the essential resources we've been given-everything goes, literally, to the Devil. We puzzle over things like depression, family and school violence, but notice how we speak and write: our communication is off-kilter-it consists of elliptical e-mails and text messages, cell-phone nattering, political and advertising rhetoric designed to flout meaning of any kind... it's as if we write with our thumbs, read just to pass the time, and can only half-hear anybody or anything because our ears are stuffed with buds so we can drown out whatever's around us. How the heck are we supposed to receive illumination? (See: I'm already hectoring everybody. My epitaph should read, "Don't get me started!") One of Dickinson's poems starts, "Musicians wrestle everywhere," and another one begins, "Artists wrestled here!" In those poems, both struggle and repose wrestle together in music, on the easel, on the page. There's something almost comic in that wrestling (as there oddly is in the Biblical image of Jacob hand-to-hand with the angel; in Old Testament days, warfare was already pretty sophisticated, so that image was almost nostalgia for simpler times), as in much, one forgets, of Dickinson. The tragicomedy of these images helped me visualize how I had to work: the poems in this new book wrestle with themselves because that what our thoughts and our language do: in fact, that's what they're for. We have kids, dreams, hopes, and wishes that keep us looking forward; at the same time, we're destructively and self-destructively fixated on wounds, grief and grievances from the past, sometimes the inherited past. Where is it all headed? Larkin says, "Man hands on misery to man." The saving grace, if there is any, turns out to be that this all takes on not just an intensely and necessarily angry tone, but inevitably also and simultaneously a comic one. Squandermania has a few bits in it from Burton's great Anatomy of Melancholy, which consists of about 1,000 pages of possible cures for depression, none of which work; it's a supremely moralizing work, yet one filled with many exuberant and comic moments. Magical ones, too, like the cures made from the dust of ground-up gems. Burton's book has ups and downs, just like we do in our daily lives, so despite trying to be taxonomical and scientific it's really very emotional. Best of all, it's almost entirely made up out of quotations and anecdotes, so it led me to all sorts of things: early English lapidary verse, old sayings that aren't said anymore, obscure Latin and Greek philosophy and poetry, among much other stimulating exotica. I thought I was doing something very serious... and then I read the title poem at a poetry reading ("Squandermania; or, Falling Asleep over Delmore Schwartz"): people laughed, thank goodness! Even better, it was that brittle, nervous laugh you hear in the dark during the ridiculously queasy scenes in horror movies. There's a gruesomely thin line between fear and comedy. Your book Union (Zoo Press, 2002) was the only book of poems to be recognized for the Boston Globe/L.L. Winship-PEN New England Award in 2003. Talk about your book which breathes so much emotion/conflict. Union was a book that tried to map out some things that are uniquely American in our emotional and historical conflicts. For me, grief and pain are not solely in the realm of the individual, but are related and correlated to history and tradition. Marriages fall apart, families fall out with each other, but then whole countries and cultures get reshaped around those who live in them-so it's no surprise that our domestic life takes on a certain cast, by extension. Nothing lives or dies in complete isolation. The past hurts, and that's the one thing we all share. The past binds us together, no matter who we are or how different we are. We fight with ourselves and among ourselves. For all that, the poems in the book are love poems, in the end: love for those no longer here, but also love for the odd things that have vanished from Memphis, where I grew up. Somehow, this leads to song. I really started writing those poems in response to the kinds of music that was around me. You could see Elvis and Isaac Hayes driving around town; everybody I knew was in a band, and their relatives could sit on the porch and remember old, old songs. But the crystallizing moment was when I saw a blues singer, Lilly Mae Glover aka Ma Rainey II, who sat in a wooden throne while she sang, stomping out emphatic beats with her foot that seemed almost to fight with the melody. I started to hear variable two- and three- beat lines as a mode of both embodying and reconciling conflict, and that prosody ended up in my poems. Other books by you include Seneca in English (Penguin, 1998), I Have Lots of Heart: Selected Poems of Miguel Hernandez (Bloodaxe Books, 1999), and one forthcoming called The Poems of Basil Bunting. Please say a few things about each book. Well, the Seneca book was a project for Penguin Classics-I tracked down all the translations into English I could find of that great Roman poet and realized that here was someone who influenced writers from Queen Elizabeth I (a poet and translator herself) to T.S. Eliot, Ted Hughes, and even Dana Gioia! He lived in and wrote about violent times, and would no doubt have recognized lots about what goes on in the world today. He was a writer of enormous power, and far more influential in English-language poetry, even contemporary poetry, than I'd realized. As long as people combine words and political power to inflict suffering, Seneca will be with us. The Hernández book came from my adoration of that poet, whose work I came across in the original Spanish. I kept telling people, you've got to read Hernández! But hardly anyone I knew had heard of him (though he's a household name all around the Spanish-speaking world), and at the time, the few translations there were of his work were out of print. I tried to translate a few of his poems for friends, and when my mentors, Derek Walcott and George Starbuck, saw the drafts, they both insisted that I do a book of them. I did, and after years of work, it won the TLS Translation Prize, and led to other editions of his work, which makes me very happy. I still read his famous "Lullaby of the Onion" at readings, and it's such a powerful poem that I have trouble getting through it sometimes. He only lived to be 31, and died in one of Franco's prisons: he fought the good fight, for his family and his country, yet he felt till the end that the spirit can never be defeated, that what is right can never be lost. Both he and Seneca found out the hard way how dangerous it can be to write poems, something we seldom have to think about in American literary culture; and Hernandez was one of the most courageous poets who ever lived. The Basil Bunting book arose from, of all things, my doctoral dissertation! But he's the furthest thing from an academic poet. When I started to write about him, his amazing poems very hard to get hold of, but now he's back in print, and my book is designed to collect his poems properly (Bunting was published by small presses much of his life, and his poems weren't always printed correctly), and especially to show the amazing web that connected Bunting with such poets as Pound, Eliot, Zukofsky, and Lorine Niedecker. It'll be published by Faber and Faber next year, and was a labor of much love. You currently are Curator of Poetry for the Woodberry Poetry Room at the Lamont Library at Harvard University. When did you take over as Curator. What are some of the gems you discovered there? I remember years ago browsing in there for hours. It's definitely a place where writers and lovers of poetry should go to when visiting the area. (A picture ID is all that's needed to get in) Talk some of your experiences being Curator. You also run a reading series there which is wonderful. Please share some of the poets who have read there. I became Curator of the Poetry Room in 2000. There are countless gems in the collection-books, manuscripts, artwork by all the great modern poets-and so many talismans and touchstones for poets. But the ones I adore most of all are the amazing sound recordings of poets in our archive. My favorites are Eliot's almost rap performance of "Fragment of an Agon," Pound's hilarious recording in 1931 of "Cantico del Sole" ("The thought of what America would be like / If the Classics had a wide circulation / Troubles my sleep...), and Patrick Kavanagh's singing, possibly under the influence, "On Raglan Road" to the tune of the old air, "The Dawning of The Day." I'm also overly fond of Amy Lowell's cigar, given to the collection to prove that she really smoked them, and some terrific photos of Robert Lowell. I've put on so many readings now I can't really choose highlights from them all, but among the most memorable were Seamus Heaney, Franz Wright, Tom Pickard, Linda Gregg, Tess Gallagher, Geoffrey Hill, Michael Harper, Jay Wright, Lyn Hejinian, Samuel Menashe, and a tribute to Pablo Neruda. One of the privileges of my job is that I can host an amazing variety of poets. The Harvard Review and The Partisan Review are two literary journals you were editor of. How long for each one? What was that experience like for you? Challenges? What type of work did you look for? How did you find time for your own writing? I was the last Poetry Editor for the old Partisan Review when it folded just a few years ago-I'd worked my way up from errand boy (we weren't even allowed to use the bathroom in the office!) to a Contributing Editor, which was a great privilege. What an education it was! PR had published so many of the great modern poets-Eliot, Lowell, Bishop, Dylan Thomas-and one of my heroes, Delmore Schwartz, had been a poetry editor there. I was heartsick when it all ended, but I've been Poetry Editor for Harvard Review since 2001, and just became Editor of Literary Imagination: the Review of the Association of Literary Scholars and Critics. As an editor I've never looked for any particular kind of work... only whatever surprised me. I don't publish things just because I like them, but rather when I learn something from them, or imagine that other people with different tastes from mine will. Frost says: no surprise for the writer, no surprise for the reader. Something like that goes through my mind when I read submissions. The main challenge is that I have to keep things a long time to make sure I'm reading them fairly and properly. I know it's not right to keep writers waiting, but if it takes a long time to return work, in my case, it's because I read and reread and worry over everything that comes in. Even then, with great reluctance, I have to turn most poems loose, though I know the good ones will find a home. I don't have much trouble finding time for my own writing I adore being overloaded with work, and because really, life comes first. I write when I'm turned on and ready to go, and when I'm not, I'm just not. Writing for me isn't like working out, something that's good for you if you do it every day. I'm paraphrasing the Irish poet, Paul Durcan, but I figure my job as a poet is to be here, which I am--not to lay some kind of impressive curate's egg. Because being a good reader is ancillary to being any good at all at writing, I have to study hard, as much as I can, and that's what I do whenever I have time. What writer's inspire you and that you read over and over? I do as much rereading as reading: Hopkins, Milton, Dickinson, Bishop, Moore, May Swenson, Robert Lowell, poets I never stop learning from. Then I dig around a lot in used bookstores; I recently found a great set of Sir John Davies of Hereford ("If there were, oh! an Hellespont of cream / Between us, milk-white mistress, I would swim / To you, to show to both my love's extreme..."), an old edition of Traherne, a reprint of Tottel's Miscellany. Incredible stuff. As for contemporary poets, I'm keeping an eye on John Hennessy, whose new book of poems is called, Bridge and Tunnel; Hennessy writes as if he's a sort of Dante who's been exiled from New Jersey. Speaking of exiles, I also admire Philip Nikolayev's Letter from Aldenderry and Katia Kapovitch's Gogol in Rome. Those three are poets whose work I loved and admired before I got to know them, and I feel lucky that they're all in this area. Lately, I've been interested in two fine Scottish poets, Don Paterson, who read for us a while back, and Kathleen Jamie, who's coming to read this spring. I guess I'm constantly on the lookout for what Rosanna Warren recently described so very well: work that "floodlights the true oddness of life in the crafted oddness of language." I'm working on my next book of poems, which is called, The Devil Box. The Mexican poet, Pura López Cólome, referring to Pandora's box at a reading I hosted, called it a devil's box! She's very spiritual, and my new poems are partly stimulated by her musical devotion to life: she's a cancer survivor and an unusual talent, and I feel like I have wings when she reads her poems in Spanish. That book will be for her. Any last comments or something else you would like to share in this newsletter? I don't have any last comments, because I've already gone on too long. Typical.